We spend a lot of time in our bedrooms, so it’s important that we take the time and effort to make it feel personal and comfortable. Part of making a bedroom comfortable is furnishing it with the right items. When it comes to bedroom furniture, there are a lot of decisions that need to be made, from the foundation of the room to bedroom accent pieces and accessories. In this blog, we will review some of the essential bedroom furniture you will need as well as some helpful tips to make the selection process easier. Bed frames are used to position the mattress and base off of the floor. There are a variety of bed frames to choose from to fit the style or feel of your room. Consider some of the most popular bed frames to determine which is right for you. Panel Bed Frames. This bed frame features a headboard, footboard, and side rails for the center mattress support. Typically, box springs are needed with these bed frames. Storage Bed Frames. This functional bed frame has drawers built into the base for storage of items such as clothes, blankets, pillows, etc. Platform Bed Frames. This type of frame features a higher base, which often includes a flat, solid platform. Upholstered Bed Frames. Softer than standard frames, an upholstered bed frame is covered in fabric from headboard to footboard. Some also feature decorative details like tufting or nailhead trim. Bedroom Dresser. Dressers come in a variety of styles and shapes. Some dressers are low and wide and include six or more drawers, while others are tall and thin. Dressers are a great way option for storing clothes and other accessories and items. Plus, you can add can add decorative items on top or add a mirror to create a vanity. Night Stands. Meant to be easily accessed from your bed, nightstands should sit at the same height as your mattress. Nightstands are commonly used to hold phones, glasses, water, and other bedside essentials. Benches. Benches are a great addition to your bedroom. Offering extra seating and storage, benches are a bedroom essential. Desks. Desks create aN area of creativity, inspiration, and productivity. Additionally, desks offer additional storage and added aesthetics to your bedroom. Once you have chosen a bed frame, storage furniture, and accent furniture, you are almost finished furnishing your bedroom. All that’s left to do is add bedroom accessories such as pillows, rugs, wall decor, and more and you’ll be closer to creating a space that offers ultimate comfort. 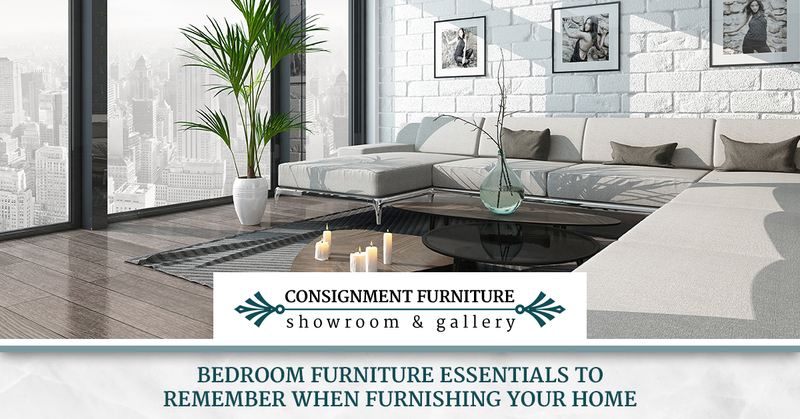 If you are looking to furnish your bedroom, rather than spending more money at retail bedroom furniture stores, consider consignment bedroom furniture! At Consignment Furniture Showroom and Gallery, we have a wide selection of new and gently-used bedroom furniture at affordable prices! To learn more, contact us!